Once upon a time, not so long ago, a freelance writer wrote a query letter and sent it by mail to one editor. Then the writer would wait. After a few weeks, the writer heard back from the editor. Or not. If the writer received a rejection letter, he would send his query to another editor by mail. And then he would wait some more. On and on it went until an editor accepted the story idea. Or not. If the writer’s story was accepted for publication, he happily wrote the story. And then he started the process all over again with a new story idea. Every query letter was sent by snail mail, as were the editor’s replies. And this assumes editors actually replied to each query. This is how freelance writers worked before the advent of computers and the Internet. Pitching articles and getting them published was time consuming and laborious. I'm amazed most writers still follow this archaic process. They send their query letter to one editor at a time. Seriously! If you’re using this antiquated system, chances are you’ll grow old and gray before your list of published articles reaches double figures. How can you speed up this pitching and querying cycle? How can you improve the chances of getting your story ideas accepted more quickly? I've been using simultaneous submissions since I started freelance writing. If you want to get published faster and earn more from your writing, this is the key strategy. Times have changed! Thanks to computers and email, you can send your query letter simultaneously to every magazine on your distribution list. Hitting every editor on your list at the same time cuts your waiting time down from weeks to merely days or hours. Using simultaneous submissions, I once had an article accepted for publication within ten minutes of sending it out. Using simultaneous queries is a vital cornerstone of a successful marketing platform. By using this technique, I’m able to get a 90% acceptance rate for my articles. That’s right: 90%! If you don’t already have a 90% acceptance rate for your story ideas and you want to significantly improve your acceptance rate, read on. I’ll tell you how to do it. Step 1. Create distribution lists for every genre you write about. I create extensive distribution lists with the editor’s names and contact details for all the magazines in every genre I write for. This includes magazines in all other English-speaking countries. 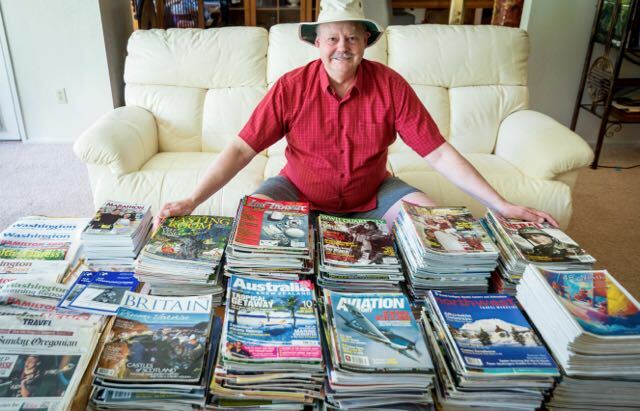 The number of magazines on my various distributions lists ranges from five to seventy five, and includes magazines in the U.K., the U.S., Canada, New Zealand, Australia and South Africa. Step 2. 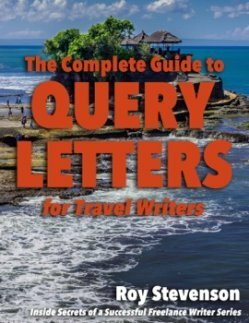 Create an enticing query letter. The query letter is your sales tool. You can send the same query letter to every editor on your list. But make sure to change the salutation and magazine references on each query letter. Step 3. Send your query letter to every magazine on your list that’s a good fit for your story. After creating an enticing query letter, I send it out to every editor on my list if I think the publication is a good fit for my story. Then I sit back and wait for an acceptance email. This system works nine times out of ten for me. If my story idea is a good one, it will resonate enough with an editor somewhere around the world and my story will be accepted for publication. Why should you pitch every magazine on your list? The reason is simple and formulaic. The more magazines you pitch, the greater the statistical chance someone will pick up your story. There is absolutely no predictability about who will go for your query, and who will reject it. This means you need to pitch all of the magazines on your distribution list. I know plenty of freelance writers who limit pitching their stories to just one or two magazines. They obviously believe these magazines will be a great fit for their stories. But these writers have a far lower publication rate for their articles - usually between 25% and 40%. The reality is, we have no way of knowing what an editor really wants at any point in time. Countless times I’ve been surprised when I thought a particular magazine would be an ideal match. Yet the editor wasn’t interested. Often I didn't even get a reply. Other times I’ve pitched a magazine I thought was a long shot. When the editor emailed back enthusiastically with, “we’d love this article”, I was surprised and thrilled. Many of my freelance-writing friends are amazed at the sheer audacity of my simultaneous submissions approach. Writers fret needlessly over using simultaneous submissions. They hold back because they’re afraid of receiving multiple acceptances. If you worry about this, I’m here to tell you this is simply not an issue. First, it’s not likely to happen very often. In ten years as a freelance writer I’ve always used simultaneous submissions. Having two editors accept the same story has only happened to me a handful of times. If you have strategies for dealing with this rare situation, everyone walks away happy. Here are a few ground rules. And, I want to emphasize these are rules, not guidelines. Rule #1. Never sell the same article within the same market at the same time. When I polled editors about selling articles to two magazines in the same genre, this was by far their greatest fear. They do not want to see the same article published in a competing magazine in the same time period. Every freelancer should know this is just not done. Thus, it’s the most important rule to remember. Rule #2. If two editors express an interest in the same story, never, ever play one editor off against another. This is freelance writer suicide and a good way to have both editors put your name on their “pariah” list. You’ll never get a story in either publication again. Go with the first editor who accepts your story. Then deal with the second editor using one of the strategies mentioned in Part 2 of this article. Carla Banning, editor of Lost Treasure has experienced this first hand; “I do occasionally encounter a writer that says he or she submitted the same story elsewhere and needs an immediate promise of publication or they will let the other publication have it as an exclusive.” Her standard answer is, “Please feel free to go ahead and do that”. David Castle, editor of Running Fitness asks his writers to be up front and honest. “If they play me, then they lose my faith”. Allen Cox, editor-in-chief of Northwest Travel & Lifestyle says that if he had a story yanked by a writer after they had a higher offer from another magazine, “I’d reconsider working with that writer again. Once I accept and assign a story, I expect the writer to meet his obligation to deliver”. Derek Buono, editor of Beer magazine also agrees with the importance of writers building a relationship with the editor: “If that happens, the story is not of interest to me anymore. If you want to build a relationship, don’t play games”. Rule #3. If two editors want the same story, always be scrupulously honest with both editors. Let the second editor know what has happened and then make your alternative pitch, as I explain in the strategies in Part 2. 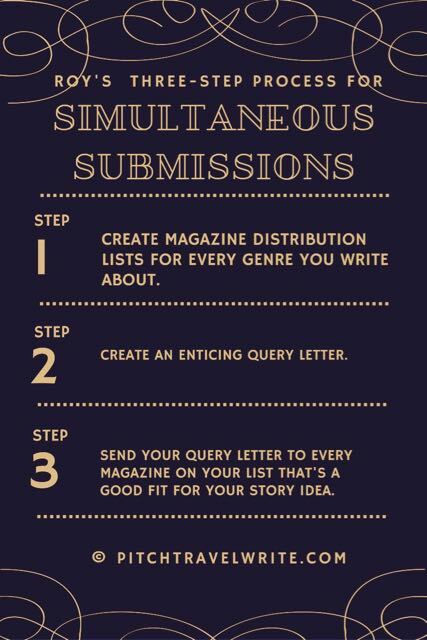 Using my 3-step process simultaneous submissions will help you get published more frequently. And remembering the rules for simultaneous queries and multiple acceptances will keep you out of trouble. Part 2 of this article discusses some strategies for dealing with simultaneous acceptances – the rare and happy occasion when more than one editor wants to buy the same article at the same time. You might also be interested in reading the 2 most asked questions about simultaneous queries.